Wellington, FL - Opening day at the 2013 Adequan Global Dressage Festival WEF Dressage Classic CPEDI3*, presented by Today's Equestrian and Fellows, showcased many of North America's top Para-Dressage riders. 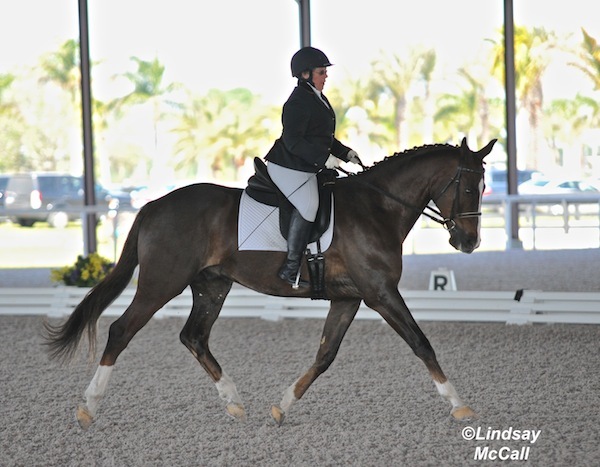 Equestrians from Canada and the U.S. competed in the Team Test completing their first of three days of para-dressage tests. The friendly but competitive atmosphere between the countries was illustrated among the riders as they rode down centerline in the Van Kampen Arena. The ground jury included Carlos Lopes (POR), Bo Ahman (SWE), and Hanneke Gerritsen (NED). Earning the top scores in team test competition was Grade Ia rider Jody Schloss of Canada and Inspector Rebus; Grade Ib Canadian Ashley Gowanlock and Ferdonia 2; Lauren Barwick of Canada and Off to Paris in Grade II, Eleanor Brimmer of the U.S. and Carino H in Grade III; and Lynne Poole of Canada with Vasco E. Para-Dressage CPEDI3* continues over the weekend at the Global Dressage Festival show grounds in Wellington, FL.The Adequan Global Dressage Festival CPEDI3* is the first opportunity of the 2013 season for para-equestrian dressage riders in Grade Ia, Ib, II, III, and IV to begin the qualifying process for the 2014 Alltech FEI World Equestrian Games in Normandy, France. With the 2012 London Paralympics in their rearview mirrors Canada and especially the United States is using 2013 as a developing year. There are new horses, new horse and rider combinations, new dressage tests and a few new para-dressage equestrians. Canadian two-time Paralympian Lauren Barwick was faced with her first execution of the Grade II Team Test with horse Off To Paris. Although the pair had a successful 2012 season, Barwick went back to the drawing board to make good, amazing. Barwick laughed, "I think I should have turned my brain on today." On a serious note, "I have been competing nationally this year and we have been picking away at movements. On purpose, we have been forgetting the big picture and working on little things. It's very frustrating for me because I like the whole big picture and want the big picture. However, it's about training today for tomorrow. I know the things we worked so hard on today were better, even though it caused the pieces that are normally good, to fall apart. My plan is identifying, isolating, and recombining." 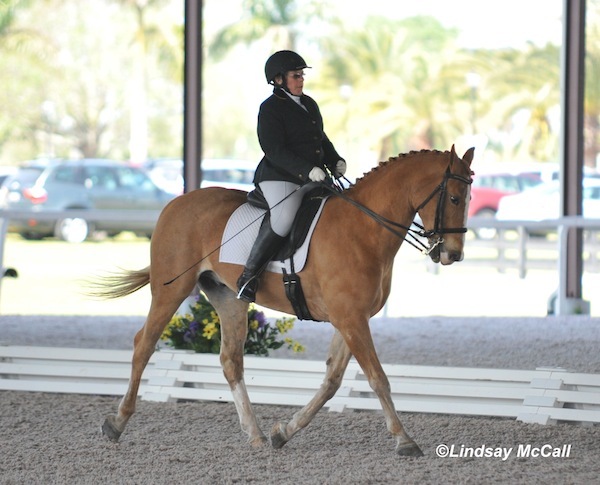 Lauren Barwick earned the top percentage score of the day with a 68.922% in Grade II competition. 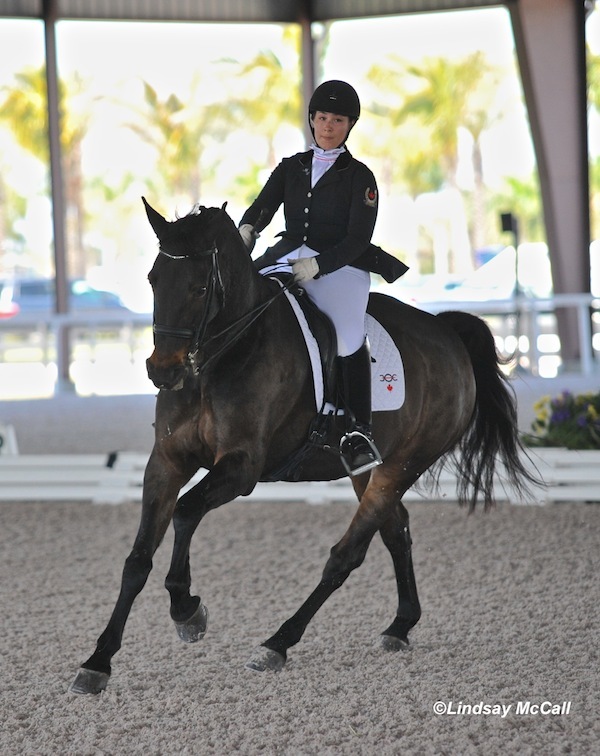 In Grade Ib fellow Paralympian and teammate Ashley Gowanlock competed with Barwick's horses Ferdonia 2. Barwick commented, "I am very excited to see Ferdonia back in the ring. She didn't make it to London and we were really concerned she wouldn't make it back in the ring. To see her back in the ring is phenomenal for me." Gowanlock replied, "I am thrilled. It's her first time coming back from an injury since she has been rehabbing since before London. I knew what she could be, and I knew it was in there, but I wasn't sure what was going to come out when we got in the ring on Friday. The atmosphere, pressure, tension...there was definitely some tension but she was amazing. I was so proud of Ferdonia and excited for what's coming." After the 2012 London Paralympic Games riders had to regroup and refocus for the 2014 Alltech FEI World Equestrian Games. Gowanlock explained, "You almost have to start over. You had this amazing experience and say to yourself, 'What did I learn and how can it get better?' You are always thinking what can I learn today to take with me tomorrow. I am excited and happy and looking forward to tomorrow at this calm and beautiful facility." Gowanlock (CAN) and Ferdonia 2 topped the Grade Ib competition with Laurietta Oakleaf (USA) in second aboard Niekele fan Busenitz. 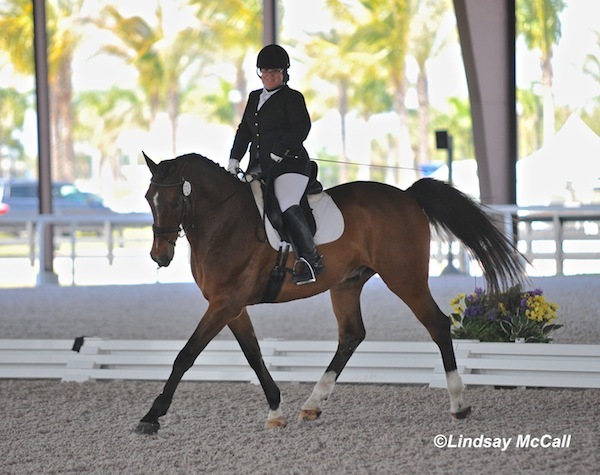 Sydney Collier (USA) and new horse Wentworth executed a precise and elegant Grade Ib test but her current re-evaluation of her classification creates a non-percentage calculation on her test scores. Collier's new horse Wentworth was purchased from Ottawa, Canada. We went up there in the Fall to look at him. At that point I was still in a cast. I rode him without stirrups and did five steps of trot. We clicked very nicely and right away. He made the journey from Ottawa to Wes Dunham's and we were doing trips back and forth from Ann Arbor, MI." She continued, "For Wentworth's first show with me, he was great. His tempo was nice and steady. He tuned out the stuff he had to tune out on my left side but at the same time he was listening and totally tuned in. This is his first show in years and he has been so great adapting to the new environment." In Grade Ia, Jody Schloss (CAN) earned the top score with Inspector Rebus. Following only .797 % behind Schloss with Canadian Robyn Andrews and Fancianna. 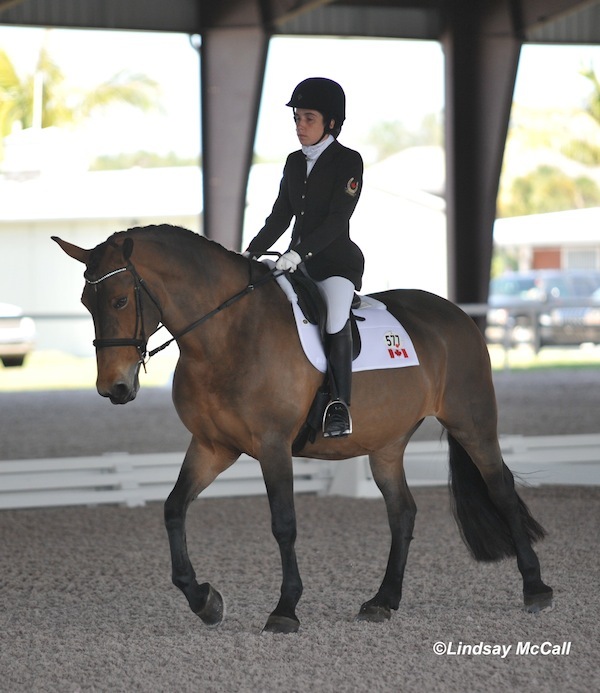 In Grade III Eleanor Brimmer (USA) of Wayazata, MN earned the first place score with partner Carino H.
In Grade IV, Lynne Poole (CAN) earned the top accolade with Vasco E. "I was really pleased with Vasco," smiled Poole. "He stepped up his game last year, we put some weight on him, and he's getting more mature and settling down. I was really pleased with him today." For Poole the change in planning has helped to focus on the 2014 calendar year. She explained, "Equine Canada came up with a training program that is done on a big spreadsheet. We sat down, had a look at movements, and really focused on that. Each month we have a meeting with the team coach and head of Equine Canada so we can really focus with stepping up our game." She continued, "It's so important that we keep getting out and keep doing these shows. Most of us, without funding, we can't get to Europe and we so desperately need this show. We are so thankful. The facilities are great and it is a lovely ring. I was quite happy to be in the covered arena because it was cooler. Everybody around the show grounds has been wonderful. I was so glad they had a CPEDI3* for us." 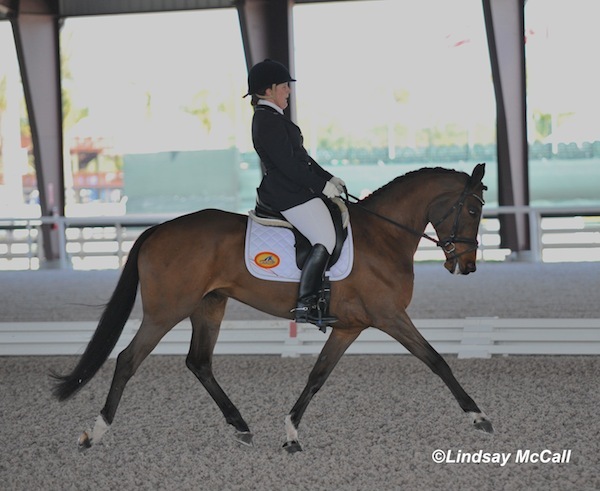 United States Para-Dressage rider concurred, "I am very grateful for the opportunity that we have here to show at Global. Having three star competitions are so important as riders for our growth and development. I am so glad we had a venue that opened their doors to us. The atmosphere here is more like a European event it's a great opportunity as riders. I wish more riders from the U.S. came here but I know it's tough to find horses, money and sponsors and get across the country. I am grateful for the opportunity we have in front of us." Jordan earned the second spot in Grade IV behind Poole and she also earned her qualifying score for the 2014 World Equestrian Games. She commented, "I was really thrilled with both horses for different reasons. Sebastian has had a really good winter of training. The horse I have underneath me now is an improved and better horse than at selection trials; He is clearly loving life." 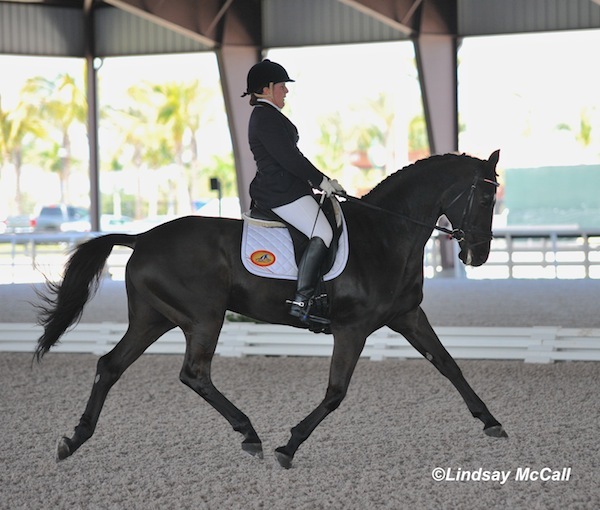 Grades Ia, Ib, II, III, and IV para-dressage individual tests continue in the Van Kampen Arena beginning at 10:30 a.m. Saturday. Saturday's Individual Test will be combined with the Team Test and considered for the final team championship accolade. Sunday will continue with the exciting freestyle tests to music followed by an awards ceremony. 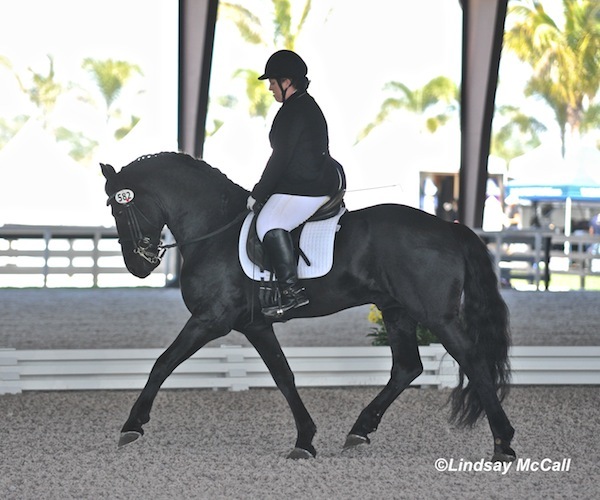 For more questions about Para-Equestrian Dressage please contact Hope Hand at Hope@uspea.org or (610) 356-6481.